If there's one way to enjoy proudly South African food while cycling through some of the most iconic passes in the country, it's with Jan Braai's Tour de Braai. If you're a keen cyclist then this event should be on your travel-bucket list as riders get the opportunity to tackle iconic passes such as Montagu Pass and Rooiberg Pass. Then spend the nights soaking in luxury at accommodation spots in Oudtshoorn, Calitzdorp, Rooiberg Lodge, Riversdale and Swellendam. Tour de Braai - a creation of South African braai master Jan Braai - sees cyclists exploring Klein Karoo towns while riding for a week along gravel and district roads. It takes place twice a year - in May and November - and with the third cycle event underway, the event organisers have announced that entries are now open for the next event which takes place from 4-10 November 2018. Click here to enter. "Fine wine, dining and an unrivalled ride experience are the hallmarks of the Tour de Braai, with fun and relaxation the main aim of the riding. It’s the ultimate cycling holiday," says Tour de Braai, which has become one of SA's leading gravel bike tours. Tour de Braai has recently partnered with Specialized Bicycles Africa, which is the official bicycle and technical sponsor. 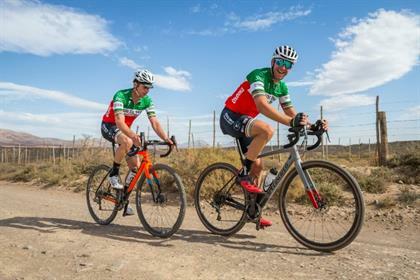 "Participants of the Tour de Braai will have the option of test riding a Specialized Diverge gravel bike at the event should they wish to do so," says Tour de Braai, adding that a mechanic will also look after tour participants along the route and provide evening bike services. will help the children get to and from school, allowing them also to have freedom of movement around the small Klein Karoo town. Jan, who will be riding the new Specialized Diverge, says “We know world road champion Peter Sagan rides the Venge and Tarmac, and recently won the Paris Roubaix on his Specialized Roubaix. On the other end of the spectrum there is Jaroslav Kulhavy winning the Cape Epic on his Specialized Epic and Sam Gaze recently winning the UCI World Cup Mountain Bike event in South Africa, also on the Epic model. "With the Tour de Braai solely aimed at people who ride for fun and love the experience of riding, we can say all participants of the event are world champions at having fun on a bicycle. That is why we chose the Diverge; it’s a purpose-built bike for fun riding on gravel roads,” he says. Tour de Braai says that the gravel bike market is growing in South Africa, and Specialized sees this event as an ideal way to showcase their range of Diverge gravel bikes, and allow riders to test them in a fun and friendly environment. As part of the most recent Tour de Braai that took place in May, Jan and the Tour de Braai participants, together with Qhubeka Charity and Investec Asset Management made a stop in Calitzdorp for a bicycle distribution project at the Calitzdorp High School. Sixty learners at the school received brand new "Qhubeka Bicycles" which will help the children get to and from school, and provide them with freedom of movement around the small Klein Karoo town, says Tour de Braai. “The Tour de Braai distribution is such a lovely event because it brings together people who are celebrating the beauty of South Africa’s landscapes and food, the joy of riding a bicycle and the potential we all have to make a difference in the lives of others,” says Tsatsi Phaweni, Qhubeka Executive Director. “Tour de Braai combines two of my favourite South African activities - braaing and riding bikes,” says Johan Badenhorst, Specialized Bicycles Africa Marketing Manager. Tour de Braai says that riders get to stop for braais at scenic locations along the route, with back up provided by Specialized and the Tour de Braai team. "Every evening, riders are treated to five-star meals, while staying in luxury Klein Karoo accommodation," it adds. Cost: R40 000 per team of two. Includes two sets of bespoke Tour de Braai rider kit (jersey, windbreaker and bibs) all meals (breakfast, lunch, supper), drinks, accommodation, all event photographs and rider back up, plus the opportunity to test the Specialized Diverge. Click here to enter. "Non-riding participants are welcome," says Tour de Braai, adding that non-riders will receive all of the above, except the cycling kit. "Instead, non-riding participants will receive complimentary spa treatments while their partners are out riding!" adds Tour de Braai.